The Be Green Packaging Store is the world's premiere website to purchase biodegradable, recyclable and eco-friendly packaging for restaurants and small businesses. 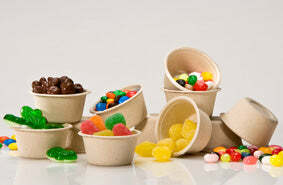 We offer a complete line of compostable and recyclable food packaging for a variety of uses. Our current foodservice line offers clamshell containers, plates, trays, cups, lids, and sushi trays. Why choose Be Green Packaging for your restaurant or business? Quite simply, we offer the most durable, aesthetically pleasing green packaging available on the market. Our proprietary technology allows us to create an environmentally friendly product made from plant fibers that is unparalleled in performance. Our foodservice line is composed of annually renewable, wild-harvested plant fibers such as bulrush, bamboo and bagasse, among others. Be Green's entire line of products is backed up by a host of environmental and social certifications. The proprietary fiber blend we use results in an extremely durable product that is simultaneously visually appealing and lightweight. Our containers are oven safe, microwave safe, and freezer safe. Try our green food packaging today and integrate an industry leading 3rd party certified solution into your operations.